With a dazzling display of fireworks, Hong Kong marked 20 years since the city ceased to be a British colony and was returned to Chinese rule on July 1. At a cost of $1.5 million – paid for by private businesses – the show was the biggest celebration since the handover itself. 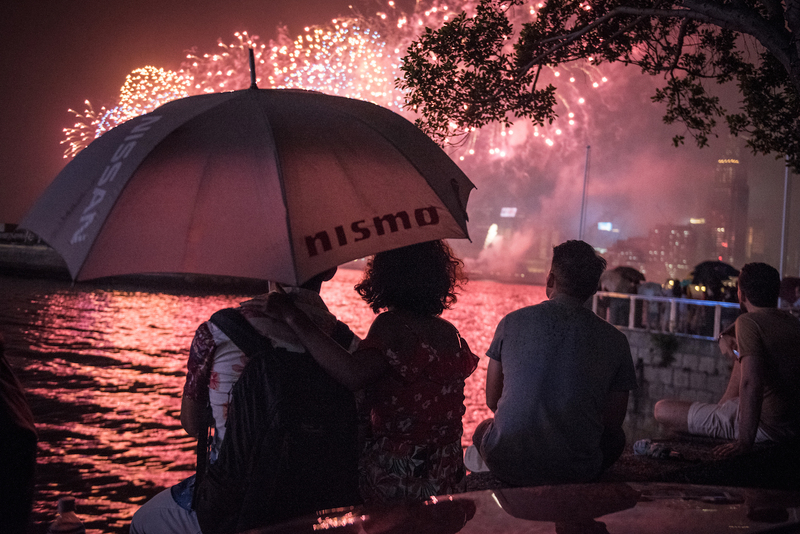 People watch Hong Kong's biggest fireworks show in 20 years from the Royal Hong Kong Yacht Club, a colonial holdover. Credit - Laurel Chor. But the anniversary is increasingly regarded with mixed feelings by many of the city’s residents. Despite the rain, organizers say roughly 60,000 people took to the streets for the annual pro-democracy march, which has taken place every July 1 since the Handover. Days before the commemoration, 20 protesters – including Umbrella Movement student leaders Joshua Wong and Nathan Law – were arrested on “public nuisance” charges while staging a demonstration. Under the 1984 Sino-British joint declaration, Hong Kong was promised a high degree of autonomy and guaranteed that its way of life would be preserved for 50 years after the handover – a concept known as “One Country, Two Systems.” But observers say the freedoms protected by that guarantee have been eroded at a frightening pace. Anson Chan, chief secretary of Hong Kong during the transition, is now a vocal advocate for the city’s rights. She believes that China has failed to uphold its end of the deal, citing the disappearances of Hong Kong booksellers who published salacious novels about high-ranking Communist party officials, and instances when Beijing has intervened in the local judiciary system by issuing its own interpretations of Hong Kong’s Basic Law (the city’s version of the constitution). In one of the strongest displays of China’s tightening grip on Hong Kong, the Chinese Foreign Ministry on June 30 called the Joint Declaration “a historical document” that “no longer has any practical significance,” adding that it was not legally binding. President Xi Jinping also gave an aggressive speech during his visit to the city for the occasion, making it clear that his administration would not tolerate anti-China rhetoric in Hong Kong. During his three-day trip, he oversaw the inauguration of a highly unpopular chief executive, and watched the city’s PLA troops demonstrate the biggest flexing of military muscle in two decades. Protesters march towards Hong Kong’s government headquarters in Admiralty. Credit - Laurel Chor. With 11,000 police officers deployed on the streets, Hong Kong was placed under an unprecedented security lockdown during Xi’s visit. The authorities called the move a “counter-terrorism” operation, but many saw heightened police presence as a guard against any mass protests like those seen during 2014’s Umbrella Movement, when tens of thousands took to the streets to demand universal suffrage. VICE News spoke to some of the people who attended the pro-democracy rally on July 1. (Note: The interviews have been condensed for clarity). Yoko Chan. Credit - Laurel Chor. Jeffrey Andrews. Credit - Laurel Chor. Ms. Lam. Credit - Laurel Chor. Angie Wong. Credit - Laurel Chor. Ken Tsang. Credit - Laurel Chor. Polly. Credit - Laurel Chor. Tanya Chan, 45, legislative councillor. Tanya Chan. Credit - Laurel Chor.